We are on a mission to make each birthday happy and every child celebrated. Box of Balloons provides birthday parties for children in need. We partner with community social workers to identify children who otherwise will not be celebrated and our volunteer put everything needed for a themed party into a box. The birthday box is then given to the parent or caregiver so they can be empowered and celebrate their own child. We are hoping to expand to each state across the country. All of our chapters are volunteer led! 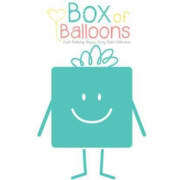 Would you recommend BOX OF BALLOONS INC?